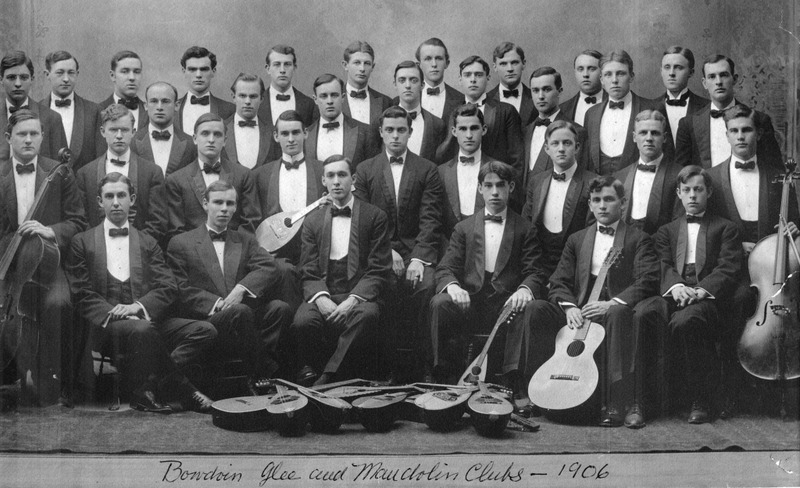 Group portrait of the Glee and Mandolin Club. Front row, left to right: Clark (Bowdoin, 1906), Brewster (1909), E. Crowley (1909), Bower (1909), Morrill (1907), Packard (1908). 2nd row: Lumbard (1909), Kane (1909), Percy (1908), Chapman (Leader of the Mandolin Club) (1906), Andrews (Manager) (1906), Johnson (Leader of the Glee Club) (1906), Pike (1907), Bavis (1906), Bridge (1909). 3rd row: Mikels (1905), Weed (1907), Bass (1907), Wilson (1907), Leydon (1907), W. Crowley (1908), Winehall (1907), Cox (1908). Last row: Thaxter (1909), Stetson (1906), Haines (1907), Sheehan (1909), Linnell (1907), J. Drummond (1907), Brown (1909), Ham (1908), Chandler (1907), Hughes (1909).